For the management of disasters, the use of Natural Language Processing (NLP) for the extraction of facts is in its early stages. Some of the systems are being developed but they are not addressing the specific problem of disaster management. 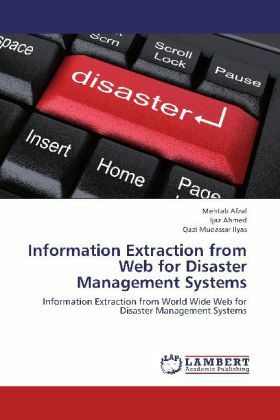 Most of the available online disaster management systems do not employ the semantic technologies of automatically converting the data into information and are dependent on manual input. In this research work a new approach for implementation of disaster management system is proposed, implemented and evaluated. The developed system searches for the disaster related data from the unstructured world and extracts the disaster related information from that data. An ontology based crawler is responsible to search for the URLs containing the required data. This data is then passed for the Information extraction. So, the main focus of this work is on the development of system that can extract the disaster related information from text resources.